What room color schemes are good for you, depends on your styling, your taste and the function of your room. Apart from that, there are several ways to make room color schemes. There's such a dazzling amount of paint colors and possible color combinations available, that it might be good to eliminate some of those possibilities. Choosing paint colors is a creative process. Which is most stimulated by limitations... So: start right in your current situation. If you want to speed up the process of choosing paint colors, or just some help in it, consider using the Paint Color Cheat Sheets. The cheat sheets were developed by Yelena Kublitzky, a color consultant who works with a painting contractor (and has done so for years). It's a list of colors that have proven themselves in her practice for years, along with info on the lighting situation for each color. Click here for a review of the paint color cheat sheets. Another color scheme-tool is painting software, in which you can work over your own home pictures with existing paint colors. It gives a realistic preview on the results of your painting project. First decide on furniture, flooring and wall placements (what will stay, what will go). After that, go for bedding, window treatments or eventual new furniture coverings. And last: choose paint colors. If it turns out you need to change much more than paint colors, change those elemements first. Eventually, consider using interior design software. It's available for a relatively small price (about 40 dollars) here at 3D Home and Landscape Design Suite. In creating room color schemes, there are several ways to go about it. You can go about it rationally and apply the rules of the color wheel, but you can also use an artwork, a fabric or a rug to pick colors from it. You can get paint sample strips (the more, the better) from the painting store, but you can also use house paint software to color your own pictures with existing paint colors. Another great tool: the paint color cheat sheets, the fruit of a color consultant's long years of experience. It's a guide that can help anyone in choosing good paint colors. You can make a color scheme either by 'taste and smell', by picking colors from an artwork or rug, or by calculating with elements of the color scheme. The 'taste-and-smell' method can be done either with paint sample strips, or with house paint software. 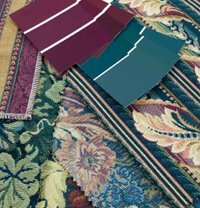 When you collect paint sample strips, also include paint samples from colors of you existing furniture, bedding, curtains etc. House paint software has some advantages - of course the amount of each color has a big influence on the results of your design, and painting software enables you to visualize just how colors will work in the amounts that you plan to apply them. You can color your own home pictures with existing interior paint colors. They show in their natural light-and-darkness, which also has a big influence on the results. Click here for more on making color schemes. How many room color schemes for the house? Some say, the whole house should be done with one color scheme, to prevent your home from becoming a decorative mish-mash. But of course, it depends on your needs, and your taste. If you prefer variety, it's better to design each room apart. Where you want to create two different and seperate 'atmospheres', each room color scheme should have its own different colors. But if you want to 'connect' the rooms together, use at least one color for two or more of your room color schemes. 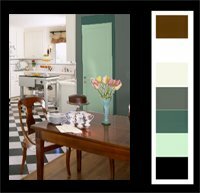 For example: if the living room has burgundy, cream and some green, the hallway could be cream and brown, and the kitchen cream, green and blue. They will all have their own atmosphere, but still 'belong' together. A decorative "mish-mash" can be prevented, by making conscious choices and rules, about how to decorate you house. If you consequently do that by heart, your taste and personality will be the "theme" of your interior decoration. The rule "each room needs its own kind of floor" is a perfectly good rule. Any choice you make, will show - and it's better to choose by feeling. The reason will show itself afterwards - that's how the creative process goes.